Almost upon arrival back in Europe, I was already on the search for great speciality coffee and decided to scan the sites of my popular roasters. In the end, after reviewing countless coffees on the http://www.hasbean.co.uk site, I opted for 3. Well! I have a fond palate weakness for Yirgacheffe coffees and this was actually the first one on my list and the first one I tasted naturally. In general, Yirgacheffe coffees tend to be quite aromatic and floral in taste with an underlying acidity and this was no exception. Using the inverted Aeropress method, a light grapefuit acidity could easily be detected, winning over the more citrus lemony aspects of the coffee. However, on using the Hario V60, a burst of sour lemon dominated the sweetish grapefuit acidity element of the coffee, making me select this coffee for my after dinner drink using the Aeropress method. Wow! what a mouthful and boy was it one. Steve of Has Bean describes this coffee as “strawberry angel delight…. and mad as a hatter”. I’ll confess, I wasn’t picking up the strawberry delight, but I don’t even know what I was picking up, so I agree with Steve on the “Mad Hatter” description. The taste notes were jumping up and down on my tongue, making it one of the most exciting coffees I’ve had a for a while. I just couldn’t pin it down and it’s one of those coffees you just have to try. 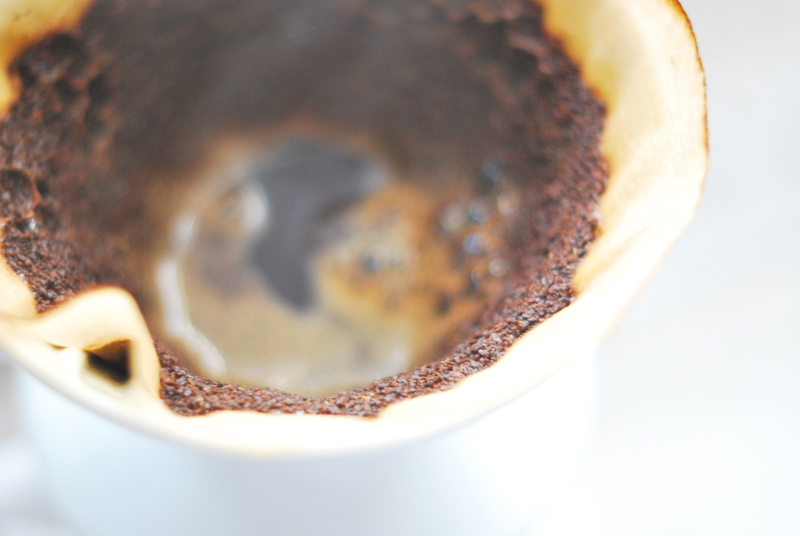 Never put milk in it, more exciting on the Hario V60 and one to make you forget about your problems at the end of the day – it has a creamy chunky mouthfeel with huge body (more so on the V60 than aeropress). 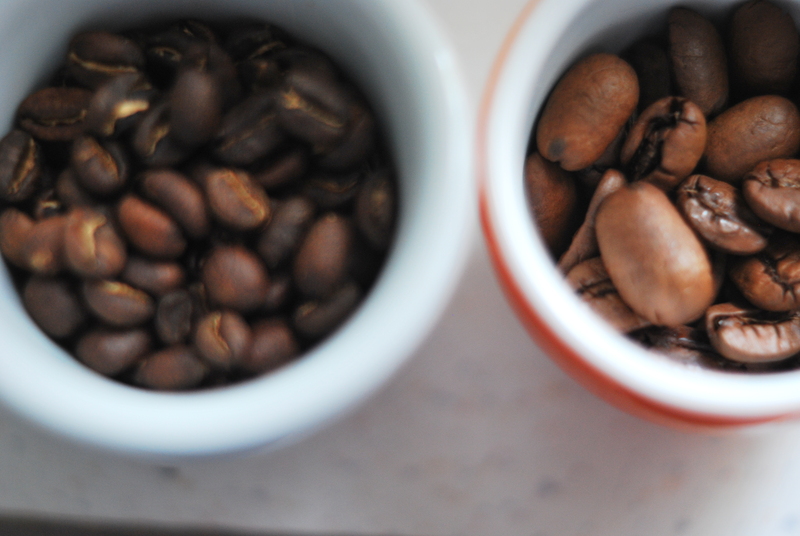 I’ve got to mention that these arabica beans are humongous – just looking at them, made me laugh – twice in size as the Yirgacheffe – they are the bigger ones in the cup at the top of the post on the right. I selected this blend because I was intrigued by the concept of a blend for filter machines, plus I needed beans for the afternoon and could only use a Filter machine, so I thought, “why not ?”. My former colleagues were like “here’s the coffee man, so what’s brewing?”. I knew that using the V60 or the aeropress would be time consuming, so this fitted the build, so to speak. The Filter method traditionally rinses out the more delicate methods in the coffee, so we were limited to the darker side with hints of brazil nuts, dark berries and cocoa. Nevertheless, a good pick me up coffee in the afternoon ahead of long meetings. This entry was posted on Sunday, September 9th, 2012 at 7:27 pm	and tagged with has bean coffee roasters, Nicaragua Pacamara Limoncello, Yirgacheffe Wote and posted in Bean Talk - Coffees, Coffee Roasters, I'm Drinking. You can follow any responses to this entry through the RSS 2.0 feed. « The Best Coffee Shop in Vienna ?